The use of aspirin in the secondary prevention of coronary disease and stroke is well established, however there is far less data available on the use of aspirin in primary prevention. Therefore, ARRIVE looked at the role of aspirin in the primary prevention of CVD in patients who were at moderate risk. In this study, 12,546 patients were randomly assigned aspirin or placebo. Inclusion criteria included men aged ≥55 years with 2-4 risk factors, and women aged ≥60 years with at least 3 risk factors. These factors included elevated cholesterol levels, smoking, HDL cholesterol levels >40 mg/dL, patients receiving treatment for high blood pressure and a family history of CHD. The primary endpoint was the time to first occurrence of CV death, myocardial infarction, unstable angina, stroke or transient ischaemic attack. After a median follow-up of 60 months, researchers found that there was no overall reduction in major CVD events, although the risk of first MI were lower in the patient cohort who received aspirin, albeit in patients who were at least 60 per cent compliant. There was no significant difference between the aspirin and placebo groups in terms of primary end point (4.29% versus 4.48 %, respectively). These results are in-line with the outcome of the ASPREE trial, another large-scale clinical trial that explored the role of aspirin in the primary prevention of CV events in elderly patients. 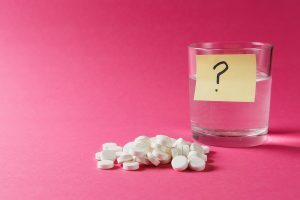 This study, published in the NEMJ showed that not only did aspirin (100 mg, once daily) fail to produce any benefit in terms of the primary endpoint – disability-free survival among older adults – but it was also associated with an increased risk of major bleeding and cancer-related mortality. Therefore, the results from ARRIVE are in-line with other large-scale clinical trials suggesting that aspirin does not appear to have a role in primary prevention in low cardiovascular risk subjects.